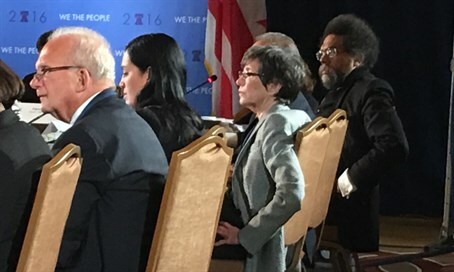 Democratic Party considers explicit condemnation of Israeli 'occupation' for 2016 platform. JTA - The Democratic Party’s platform drafting committee tussled over whether to use the word “occupation” in addressing the Israeli-Arab issue, reflecting divisions between the Bernie Sanders and Hillary Clinton camps that could play out at the convention. The Democratic National Committee held two days of open hearings this week in Washington, D.C., on the platform, inviting experts to testify. The hearings, which will also take place in other cities, got underway the same week that it became clear that Clinton had secured her position as the party’s presumptive presidential nominee. Sanders, the Independent senator from Vermont who remains in the race for the Democratic presidential nomination, appointed five members to the 15-member committee, including three who have advocated for Palestinian rights in the past: Cornel West, a philosopher who backs the boycott Israel movement; James Zogby, the president of the Arab American Institute, and Rep. Keith Ellison, D-Minn. Clinton appointed six committee members. West said during the hearing that the party’s platform should include the word “occupation,” suggesting that to do otherwise would mean being “beholden” to American Israel Public Affairs Committee. AIPAC staffers were in the room, as were staffers from other lobby groups, including J Street. Sanders, the first Jewish candidate to win major party nominating contests, said last month that he wanted greater support for the Palestinian Authority in the Democratic platform. The most recent platform, from 2012, advocates for a two-state solution, but casts it in terms of preserving Israel’s security. Howard Berman, a former congressman from California with extensive foreign affairs experience, who is one of four appointees by the DNC chairwoman, Rep. Debbie Wasserman Schultz, D-Fla., said listing the grievances of both sides would bog down the platform. “I could come up with a list, if we want this platform to get into it, of issues of (Palestinian) incitement,” he said. Robert Wexler, a former Florida congressman who appeared before the committee as an expert witness representing Clinton’s views, said that to include the word “occupation” would prejudge the outcome of negotiations, which is not the role of the party. Zogby countered that the 2012 platform says that “Jerusalem is and will remain the capital of Israel,” a statement that also prejudges the outcome of negotiations. Wexler told JTA in an interview after the hearing that introducing “occupation” to the platform would be inflammatory. “To insert language with respect to the Israeli-Palestinian conflict that is inflammatory and that prejudges items that are to be negotiated at the negotiating table, the Democratic platform is not the place to do that,” Wexler, the president of the Center for Middle East Peace, said. The drafting committee’s platform will be presented to the full committee during the convention in late July in Philadelphia. Party officials are eager not to repeat the scene in 2012, when the full platform committee, under fire for not including Jerusalem in the original draft, voted to add recognition of the city as Israel’s capital. The motion passed, but there was loud booing during the session. Wendy Sherman, a Clinton appointee who is a former deputy secretary of state, counseled against exacerbating intra-party disagreements on the issue, arguing that the platform should focus on distinguishing Democrats from Republicans, who have retreated from two-state advocacy. Matt Duss, the director of the Foundation for Middle East Peace, appearing as an expert witness, said failure to recognize the occupation as such ran counter to American values. “We must recognize that Israel’s continued occupation of Palestinian territories and its daily restrictions on the most basic political and civil liberties of the Palestinian people run contrary to fundamental American values,” he said. Wexler, in his interview after testifying, said that while the platform could be tweaked, Clinton’s views – which he said included not prejudging the outcome by referencing an “occupation” – would prevail because she is the nominee. “There was a winner of the Democratic primaries and her name is Hillary Clinton, and Hillary Clinton has a decades-long policy regarding Israel,” he said. Wexler in his testimony also said that the platform should reject bids to delegitimize Israel, including through the Boycott, Divestment and Sanctions movement.